Born in 1924, David’s childhood and youth was spent in country South Australia, first in Balaklava, a small country town in South Australia, and later in Victor Harbor. David completed his schooling at St. Peter’s College, the same school which the Nobel prizewinners Lawrence Bragg and Howard Florey had previously attended and which the prominent South Australian Labor premier Don Dunstan would also later attend. From there David entered the University of Adelaide and began studying chemistry in 1942. At an early stage he must have made quite an impression amongst his lecturers, because while he was still a first year student he was appointed by Dr. S. W. Pennycuick, Reader in Physical Chemistry, as a “cadet” and the following year he was already virtually running the second and third year practical classes in Physical Chemistry. In 1946 David first began work in the field to which he would later devote most of his career, radiation chemistry, when he started his honours project in chemistry on the topic of “Making and using radioactive elements to study chemical kinetics”. During his honours year he made his own radiobromine using radon from the Royal Adelaide Hospital’s radium source and reacting it with beryllium. The neutrons produced were slowed down in a small tank of water and reacted with potassium bromate in solution. The excess energy obtained following capture of the neutrons ejected the radiobromine from the bromate anion and could thus be separated. With valuable help from Harry Oliphant (brother of Sir Mark Oliphant) in the Physics Department, David constructed his own Geiger counter in order to measure the radioactivity of his radiobromine. In 1947 he graduated with a B.Sc. with first class honours. 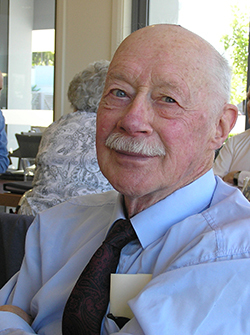 David joined (the then) CSIR Institute of Nuclear Science and as a Research Officer in the Division of Soils in 1948, soon after completing his degree at the University of Adelaide. Within a few months he was seconded to the Atomic Energy Research Establishment at Hartwell in England. At that time, Australia was using Hartwell as a training ground for Australian scientists interested in this country’s nuclear energy industry. Therefore when David came back to Australia in 1956 he returned, not as part of CSIRO, but as a Senior Research Officer at Lucas Heights in the Australian Atomic Energy Commission (AAEC), which had been established in 1953. Between then and 1981, David advanced through the scientific ranks of the AAEC, establishing his international reputation as a leader in the field of radiation chemistry. As a result of the CSIRO-AAEC reorganisation at Lucas Heights, 1982 saw David back with CSIRO as section leader of Radiation Chemistry and Technology for the Division of Chemical Physics, and officer in charge of its Lucas Heights unit. Two CSIRO name changes later and seemingly unperturbed, David continued his work on the industrial applications of radiation, specialising in the use of radiation in chemistry and biology. Throughout his career, David had been a prominent member of the Royal Australian Chemical Institute (RACI), including a year as NSW Branch President and Member of the Executive Council, and another year as Chairman of the Polymer Division and member of the Full Council. He was also an affiliate of the American Chemical Society. In recognition of his contribution to polymer science, in 1987 he received a Citation from the RACI Polymer Division and a year later the 14th Australian Institute of Nuclear Science and Engineering Chemistry Conference was convened in his honour. The Conference was attended by many distinguished radiation chemists from overseas. In the preface to the Journal of Radiation Physics and Chemistry which commemorates the occasion, the Conference President, Professor Donald Napper, Professor of Physical Chemistry at the University of Sydney, referred to David as the ‘father’ of radiation chemistry in Australia, noting his wide contribution to the promotion of both fundamental science and the industrial applications of radiation. David also had a continuing involvement with the training of future scientists. Through the work with AINSE he had an impact on research at various Australian universities and through the Australian School of Nuclear Technology (ASNT), and taught research throughout Australia and South East Asia. With Professor James O’Donnell, co-authored the text Principles of Radiation Chemistry, which also appeared as a Japanese edition. During his time at Lucas Heights, David made innumerable friends. Many were made through his work; he had the ability to communicate his enthusiasm for complex radiation chemistry and its uses to any listener. The David Sangster Polymer Science and Technology Achievement Award is named in his honour.